If you are attempting to contract with private sector buyers, there are three nationally recognized certifying bodies that have certifications that are utilized in private industry. The reasons for their use are two-fold. First, large businesses need small minority vendors to keep them in touch, and to prevent alienation, with their minority customers. Secondly, in order to conduct business with government agencies, they need to show a willingness to do work with all groups or it could adversely affect governmental entities and their decisions concerning buying from your particular firm. The biggest issue these businesses face, based upon survey data, is finding quality suppliers. Below is a listing of certifying organizations and a description of their certification. 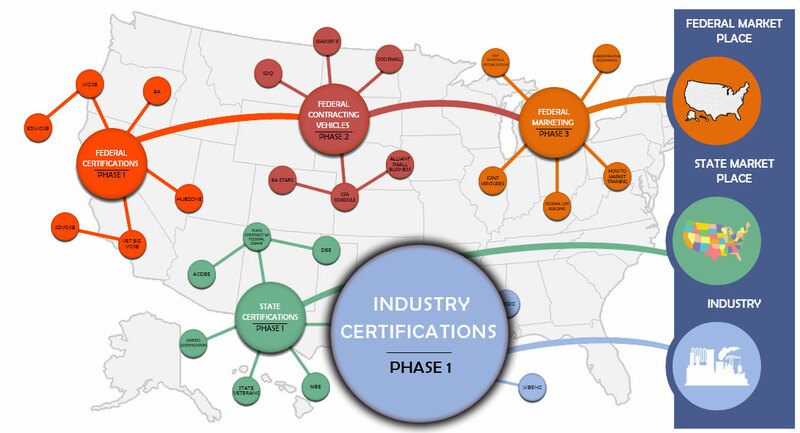 The National Minority Supplier Development Counsel is divided into 37 regions, each of which gives its certification based on the same national guidelines. This certification is considered the industry standard certification for minority owned firms in private industry. There are approximately 17,000 firms with this certification. The Women’s Business Enterprise National Counsel is the largest 3rd party certifier of businesses that are owned, controlled and operated by women. There are approximately 12,000 firms with this certification. The National Veterans Business Development Council is the national certifying body of veteran owned businesses. This certification was created in 2010 and is widely considered by corporate America as the public’s opinion on the increasing need for supplier diversity extending to veteran owned businesses.